There’s an energy revolution coming on the seabed. In efforts to boost subsea oil and gas production and reach fields further from shore, in deeper and even Arctic waters, a subsea power revolution is in progress. Several multinationals are developing systems to provide electric power across the seafloor – think subsea power sockets. Giving access to subsea power this way would help oil and gas firms move processing equipment to the seafloor, instead of hosting it on platforms. On the seafloor, equipment, including pumps and compressors, would be more effective and efficient at boosting production rates. Reduced reliance on platforms would also help reduce oil firms’ footprints, reducing pollution risk and CO2 emissions. All-electric systems would also provide more responsive control and advanced health monitoring of subsea equipment. But, this new infrastructure could support more than pumps, compressors and actuators. It could also be used to support a growing fleet of unmanned underwater vehicles, as well as supporting other industries, from ocean science to deepsea mining. At the moment, subsea oil and gas systems are electro-hydraulic. Each power consumer is fed with power and communications via separate umbilicals from a topside variable speed drive (VSD). Such a system has limited flexibility, should an operator want to add in a new well or a subsea pump. The subsea power grid concept, however, would involve a single power line to the seabed equipment (in up to 3,000m water depth at present), potentially from an onshore power source up to 600km away and with no offshore platform. Then, subsea installed switchgear and VSDs would control and distribute power to a range of users, from pumps and compressors to pipeline heating systems and ROVs or autonomous underwater vehicles (AUVs). The concept is being driven out of Norway, largely by Norway’s Statoil, along with other oil majors via JIPs. “The direct benefits (of subsea electrification) are reducing topside foot print and cost, through removal of the hydraulic system, having a smaller, less complex umbilical, smaller and lighter subsea modules, improved health, safety and environment, and simplified testing through removal of pressurised equipment,” says Vidar Strand, senior sales operations manager, technology and solutions center for oil and gas at BHGE. Strand, speaking at the Subsea Valley conference in Oslo in March, cites a 10-20 percent typical lifecycle cost saving, from going all electric, with 25 percent in some cases. Moving power electronics subsea is no easy task. Nevertheless, companies including ABB, Siemens and Baker Hughes, a GE Company (BHGE), are working on solutions, by either marinizing already proven components (VSDs, switchgear, transformers, etc.) in one atmosphere containers, or creating and qualifying new components, which can operate in oil-filled pressurized environments. BHGE has a qualified a one-atmosphere system, which was designed to transmit power 120km from shore to Shell’s Ormen Lange field, where it would power subsea compression (a project which was shelved). ABB is working on a system able to work to transport up to 100MW of power up to 600km and down to 3,000m water depth. It has built and wet-tested a subsea VSD and is preparing for a second, shallow water test, along with a switch gear this year. The complete system is due to be complete in mid-2019. ABB is putting the components in oil-filled containers and using natural convection for cooling. Siemens, was planning a full system test in 2017. Siemens is mostly putting its components in oil-filled containers too. Siemens Subsea is working on a subsea power grid JIP with Statoil, alongside Chevron, ExxonMobil, Petrobras and, since last year, ENI. Siemens is also advocating an infield low voltage distribution system called DigiGrid, which incorporates fiber optic communications. In tandem with the development of the subsea power grid, moves toward all-electric equipment are being made. All-electric actuators have been in use for 15 years and were the primary form of valve actuation on Statoil’s Åsgard subsea compression project – an industry first for subsea processing, launched in 2015, offshore Norway. Some 8.5 million hours experience has been built up with electric actuators since the first were installed on Statfjord in 2001/2, with 99.3 percent availability, Eldar Lundanes, Global System Manager, TechnipFMC, told Subsea Valley. In 2016, Total installed the first fully all-electric subsea Xmas tree (a set of valves on the wellhead), in the North Sea, offshore the Netherlands. One stumbling block to this achievement had been the availability of an electric downhole safety valve (eDHSV), which was achieved, but is only currently proven in a 5in version, which limits applications. All-electric systems also pave the way for drones. “Using all-electric you have so many more options. You can have drones there all the time, you can plug in to power and communicate with them,” says Helge Sverre, business development at Norwegian subsea inductive connector firm Blue Logic. “You could have 24/7 surveillance, cost could be reduced, it would be safer, with smaller footprint, no vessels, lower CO2 emissions…” This could be of particular benefit in sensitive areas like the Lofoten Islands or the arctic. Indeed, subsea vehicle manufacturers and operators have been developing electric ROVs, AUVs and hybrids for a number of years, with a view to enabling subsea resident vehicles which could plug in to these subsea power sockets to extract data, perform operations and charge their batteries. Advances made in inductive connectors, for two-way power and communication transfer, by companies like Blue Logic, and through water optical communication, by the likes of Sonardyne, are helping enable subsea positioning and docking, charging, control and through water communication for these vehicles. ABB’s subsea substation system design has had an ROV “socket”. With scale, these systems could even help level out energy demand, as is being done in cities where car batteries are drawn down at peak demand, when the cars are not being used, suggests Bugge, treating them like mobile power banks. Where there’s not a large amount of power to draw on, subsea batteries could be trickle charged and then used as and when required, suggests Strand. Standardization of interfaces, not least for docking, for power and communications, is seen by many as important to realizing this vision. A stickier problem is industry agreement on the failsafe mechanism for safety critical systems. Spring fail safes are currently used, but in an all-electric system, you would move to battery powered failsafe systems. “It is one of the most interesting discussions we have ongoing in the industry – spring or battery?” says Strand. The benefit of an electric fail safe is that you are able to test it without shutting in production. “With the spring, it is not easy to just release it a little bit. With an electric failsafe, you can have full control of torque and speed,” says Strand. The downturn in the oil and gas industry has helped. There’s more open minds and acceptance to new technology,” says Lundanes. “Even if the API is not moving fast, operators’ specifications are being opened up to allow new technology, such as all electric. Lundanes cites 25-50 percent cost reduction by eliminating some of the steel or thermoplastic tubes in the umbilical, and more, if the umbilical can be eliminated completely by also moving chemical storage and injection subsea, and even having local power generation for power needs (ENI is working with a wave energy buoy firm on such a concept) and using wireless communication. There’s also another benefit to going all-electric: greater process control and condition monitoring capabilities, and the potential to leverage big data. “Electric systems are inherently more instrumented than hydraulic systems, so you have better knowledge and predictability, and availability and you can further reduce system cost,” says Lundanes. Electric actuation, for example, “improves process control and actuation positioning,” says Strand. “Compared with electro-hydraulic systems, there’s a huge difference in the amount of data we can leverage.” For example, voltage, current and battery data can be measured to know if it will fire the actuator when needed. “You know more about the position of the valve, you can measure the speed of the actuator, and have a torque profile,” from which you can infer wear. Vibration data could even help infer information about what is flowing through a valve, he adds. Electric DHSVs (which can be installed faster than their hydraulic counterparts, says Strand) could also support all-electric completions inside the wells, which would then mean more intelligent completions – which again means more information about and greater control of the wells is available. Indeed, BHGE is working on a battery powered DHSV, which is expected to be ready in 2020. Combining electrification with ethernet and fiber optic communications then enables that data to be readily available, real-time, so that data analytics can be applied for production optimization, condition monitoring and predictive maintenance. The shape of the communications and computing architecture – i.e. centralized or decentralized (using edge computing) – is still a debate. 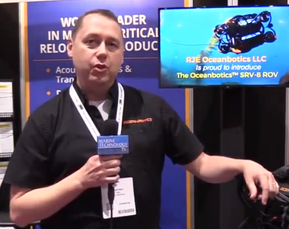 But, the bottom line is that there’s more information and more control and to this framework subsea through water communications can be added, so that vehicles can talk to the infrastructure and each other, without having to physically connect.